Jessica, over at Life As Mom, recently had a baby and she is hosting a story swap today on the topic of Birth Stories. She has asked that others post their birth stories on their blog and link back to hers. So here are the two tales of birth in my life. For those that are bothered by such tales, you may wish to stop here. Baby #1 - Okay, to set the stage, 23 days before my due date, I go to the doctor and I am already dilated, 2 ½ cm. As a newbie, I come home and freak out, how can it be, I'm not ready. I frantically wash clothes, clean the house; in a word - Nest. After a few days, I calm down. Fast forward, 16 days before my due date, I am at the doctor again, this time I am dilated 4 cm. I take it in stride, 4 cm; okay...see you next week. So here it is 12 days before my due date, a Friday and I am at work. I'm walking around with the intern that is supposed to help cover some of my projects while I am off on maternity leave, trying to give him some background on what has progressed to date, what is scheduled to happen when and what still needs to be coordinated. After a while, I get this sensation of flow, something that is surprisingly noticeable probably because I haven't had this feeling in about 9 mos. I excuse myself to see what is going on. I decide that my water might be leaking, so I call my doctor’s office to tell them I think my water is leaking. The doctor's office initially suggests I come in for a 3 pm appointment that afternoon and they will check me to see if I am leaking. Then, the nurse grabs my chart as she asks me, were you dilated last time you were in. I answer that yes, I was dilated 4 cm. She says skip the appointment, head to the hospital. Still not feeling a great since of urgency as I’m not actually feeling any contractions, I update my project log with current information, call my husband to let him know I am heading home and tell my manager that I am going to make a trip to the hospital, I think it might be time. One co-worker hears this and asks my manager if I can come back later this afternoon when they send me home? My boss says no need to come back you can take the day. I head home and tell my husband to grab some lunch, since you never know how long we are going to be there. I head upstairs to change before we go. On the way to the hospital, I call my mom to let her know we think it might be time but wait to leave. I will call if they admit me. An hour later, confirmation, it is amniotic fluid. I'm admitted and am told I need to stay in bed because my water is leaking. I let mom know, so that they can head to the hospital – they live three hours away. I’m still not really feeling any contractions, so my husband decides, we could be here for a while and heads home to pick up his laptop so that he can get some work done while we wait. Finally he returns and starts to work. There’s a lot of pressure and when they come in to check me, they tell me that if I want an epidural, I need to get it now. I’m so unsure; I ask will it get worse? Finally, I decide, why not, I might regret it if it gets to be more and it is too late. My husband packs up his laptop and heads to the hallway since he can’t be there while they tap for the epidural. So, they tap me for the epidural, which they haven’t connected yet, and as they have me move back onto the bed, my water breaks. They check and I am fully dilated. My husband returns and they have him suit up. In come the doctor, the nurses and a hundred pieces of equipment – it was amazing how quickly it went from empty to full in my room. Baby #2 – This time I should be ready for it all. I worry though, last time the only way I knew it was time was because my water was leaking. Other than pressure, I never experienced any noticeable contractions. What if my water doesn’t leak this time? The doctor checked me about 20 days before my due date and told me I was dilated 2 cm, but as a second time mom, I might have been dilated since the beginning. So, one night, about a week later I wake up around 3 am. I’ve got that sensation of flow again. Maybe it’s not real I say to myself and go back to bed. I can’t really sleep, so I get up and go downstairs to finish up some laundry I have and organize a few things. If I’m going to be gone for a couple of days and others will be staying at my house, I need to make sure it is at least tidy. I have a small snack, I don’t want to be hungry and I know once I am at the hospital, I won’t be allowed to eat anything but ice chips. I go back up and try again to sleep. I doze off for a little while. I wake up and finally, I’m convinced, my water might be leaking. I wake my husband and call my doctor. Of course, it is in the wee hours of the morning, so I get the answering service. My doctors are both unavailable and another practice is covering their deliveries for them. The doctor will call me. The doctor calls, I explain things and he says, go into the hospital and they will call him if I am admitted. I wake up my son and since it is the wee hours, we decide to just take him to the hospital. We can call for assistance once we are admitted. We pack some snacks and drinks for him as well as some stuff to do. There’s not much in a maternity ward room for a 3 year old. This time, we have to do admission through the emergency room entrance. We get checked in and head up stairs. The staff doctor comes into check and confirms I am leaking. We call my mom and dad, so that they can head our way. Once the sun is up, we call our friend to see if she can come over and help watch our son until my parents arrive. In the meantime, he hangs out in the room with us. When a nurse or doctor comes in to check me, my husband and son go for a walk. My friend arrives and she takes him to the waiting room to color and hang out. They ask about an epidural, based on last time, I decline it. Again this time, I’m not experiencing notable contractions, only immense pressure. I reach 10 cm, but I was positive for group strep b, so the doctor won’t break my water and let me deliver until I have had the antibiotic drip for 3 or 4 hours. I hang out and wait for the time to pass. My parents arrive and come in to say hi. This time they arrived before the baby. They leave the rest of the time passes and the doctor comes in to break the water and deliver the baby. I start to push, he stops me - the scar tissue from last time just isn’t stretching. He snips and then I’m allowed to push. My beautiful baby girl arrives in this world. Her brother comes in to be the first to meet her. Then, everyone else joins us. Even though this was my second delivery, I am still amazed by the whole event. 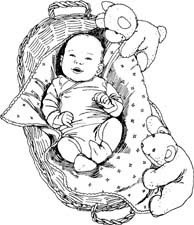 You can check out other amazing stories at Life As Mom - Story Swap: Our Baby Story.